How do I add products to the basket? To add products to the basket, simply click the green 'Add to basket' button on the product entry. Once you’ve added the product, a summary of the basket contents appears at the top right of the page where you can view, delete or increase the quantity of the selected products. This summary is displayed when you click on the green 'Basket’ button. When you’ve finished, click 'View/process order’ to access the list of added items, their quantity and price, the delivery method and the total amount to be paid. What are the steps for making a purchase? Make your purchase in five convenient steps. Basket: Add the products of your choice to the basket and click 'View/process order'. You will access the list of items you have added to the basket. 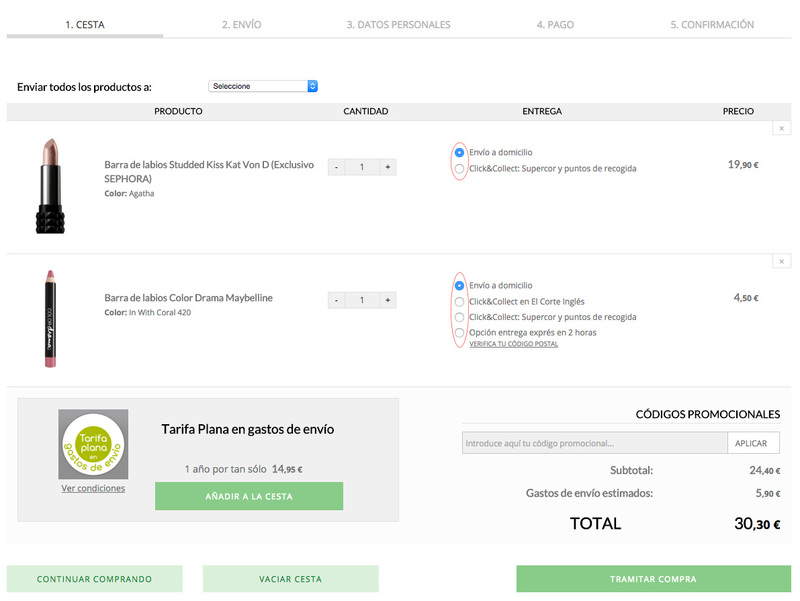 Here you can choose the quantity of an item and the delivery method: home delivery, Click&Collect at El Corte Inglés or Supercor and collection points (not all products offer the same options). In the end, you will see the total amount to be paid with the delivery charges included. If you agree, click 'Process order'. Before moving on to the next step, you need to log in, register or provide an email address and your personal details to handle your purchase. Delivery: Enter the address where you want us to deliver your order. If you are a returning customer, you can enter an address different from the one used to register. Delivery charges may vary depending on the indicated destination. If you have chosen to collect the order at a shopping centre with the Click&Collect service, indicate your name or the name of the person collecting the order and the shopping centre where you plan to collect it. If the order is being paid in instalments or with a Line of Credit at El Corte Inglés, you must come in person to sign the contract. Click 'Continue'. Personal information: Here you can review your details and indicate whether you wish to receive order notifications via SMS. 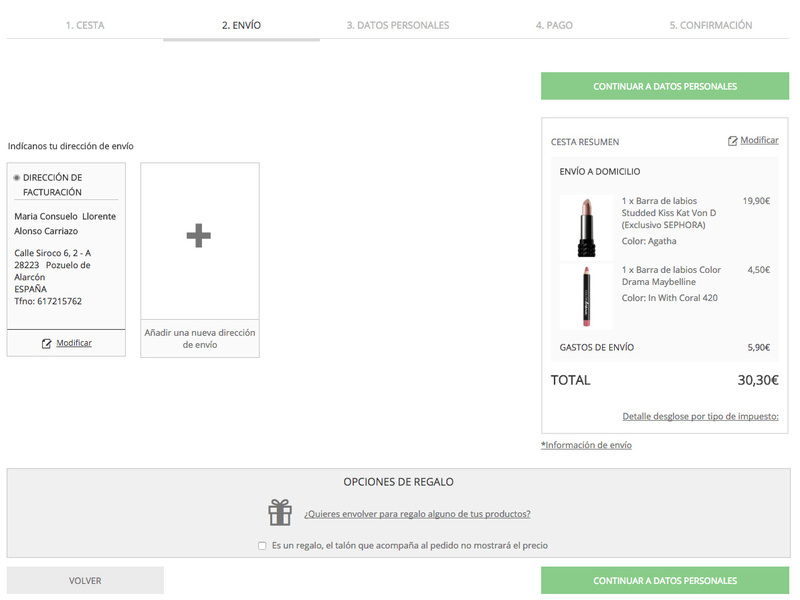 On this same page you will see the El Corte Inglés Card payment method. Enter your card number if you plan to pay with it. Regardless of your payment method, click 'Pay'. Payment: During this step you will see all the payment options. 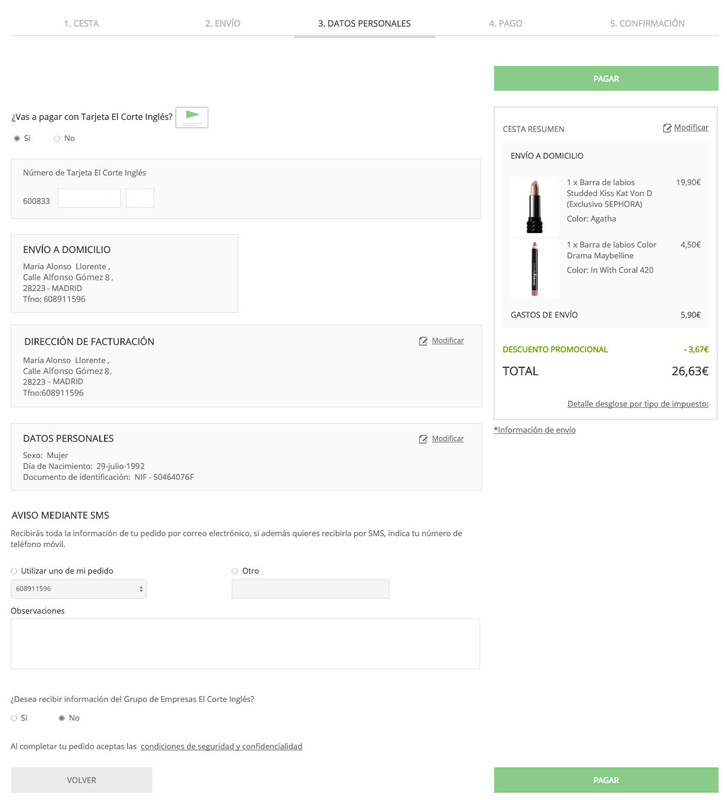 Confirm if you are paying with your El Corte Inglés Card or select another option: gift or voucher card, Line of Credit card, bank card, PayPal or cash on delivery. Once you have entered the details, click 'Pay for purchase'. Confirmation: You have now made your purchase. This page confirms that your order has been processed correctly, and shows your registration number and provides a summary of the purchased products. Any problems completing the purchase may be due to your browser version or settings. Our websites are compatible with the latest versions of browsers that are automatically updated (Google Chrome and Mozilla Firefox), and with Internet Explorer 11. If using Safari, the compatible version is 12. We also recommend you check if the issues are occurring because your browser is configured with the “High” security level option. Go to the Internet Options window under network administrator, security tab, and change it to “Medium”. How do I request an invoice for my purchases? You can also write to use 365 days a year at clientes@elcorteingles.es. To streamline the process of issuing the invoice you must provide us with the order no. of your purchase. What happens if I have not received the order confirmation email? If you have not received the confirmation email at your email address when placing your order a technical problem may have occurred. You will normally receive it after a few minutes. In any case, please check your spam or unwanted emails folder in case it is there. If you have still not received it after a few hours, contact us by calling 900 373 111 (from a landline) – 901 464 111 (from a mobile) or at clientes@elcorteingles.es.